OFTEN artists project a part of themselves into their work either consciously or unconsciously. British fashion icon Sir Paul Smith is no exception. From the vibrant rainbow colours of his Spring/Summer 2017 collection to the choice of models, he drew inspiration from his youth and the London 1960s zeitgeist. The collection encompassed themes of love, peace and harmony. 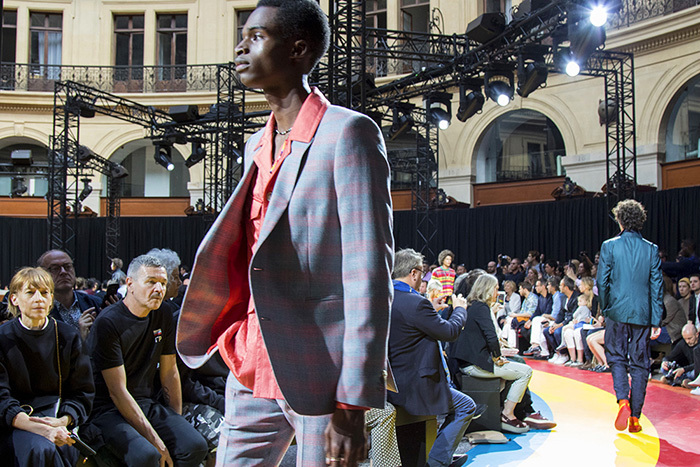 Paul Smith always manages to create a fashion direction for his collections that are consistent, relevant and contemporary.The Paul Smith invitation to the menswear show in Paris was characteristic of the designer's aesthetic. 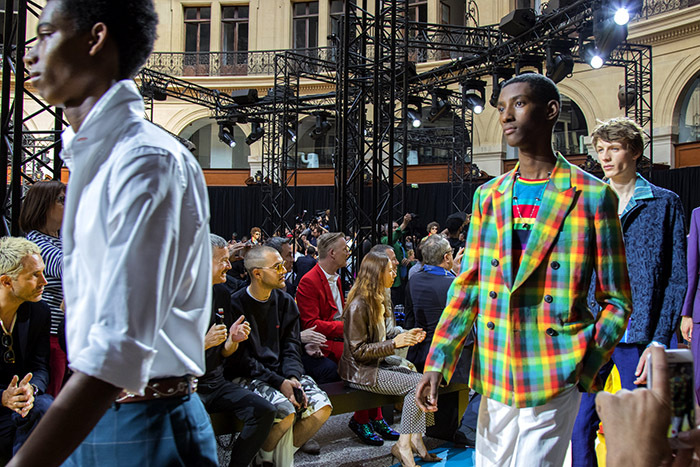 Enclosed in a long, oversized envelope, the invitation included a rainbow-coloured pair of socks, which guests waved proudly as they entered the Paris Bourse where the runway show was held. Guests were also met with a table of rainbow-coloured cocktails in the foyer before entering the show. There was no fuss or pretentiousness, the atmosphere was light and happy. It was also a child friendly event ~ a rare sight ~ with some of the front row guests accompanied by children under the age of five. 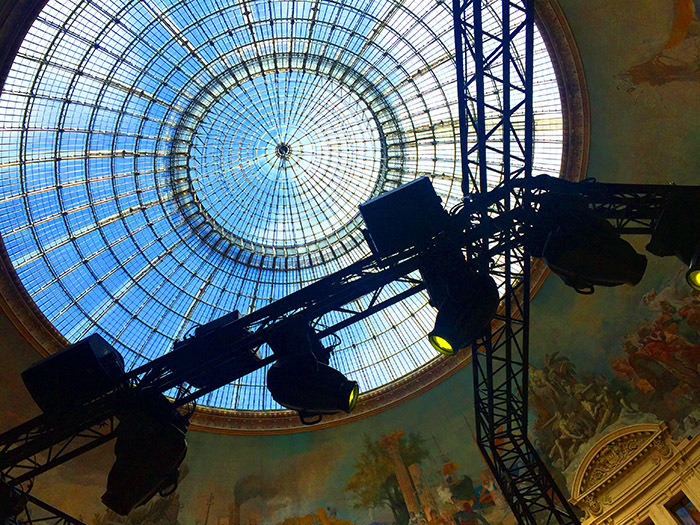 The space itself is vast, under the Bourse de Commerce heritage- protected dome was a circular runway with a multi-coloured curving floor. Staff laid out the final touches, while guests amused themselves, cocktail in hand, chatting and posing for media pictures. The pre-show vibe was very much an upmarket Notting Hill style festival and looked like one big happy party. A modern mix of Bob Marley’s One Love signaled the models’ entry on the runway circuit. 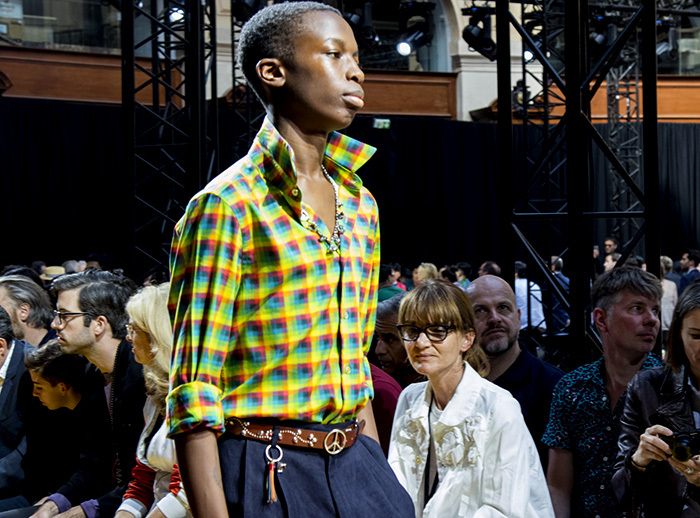 Notably this style of catwalk also referred to the traditional couture approach where guests and models’ personal space was fused together by their proximity. Thus it made for a more intimate experience even within the colossal expansiveness of the Paris Bourse (which was sold to the Chamber of Commerce by the City of Paris for a token one euro in 1949). 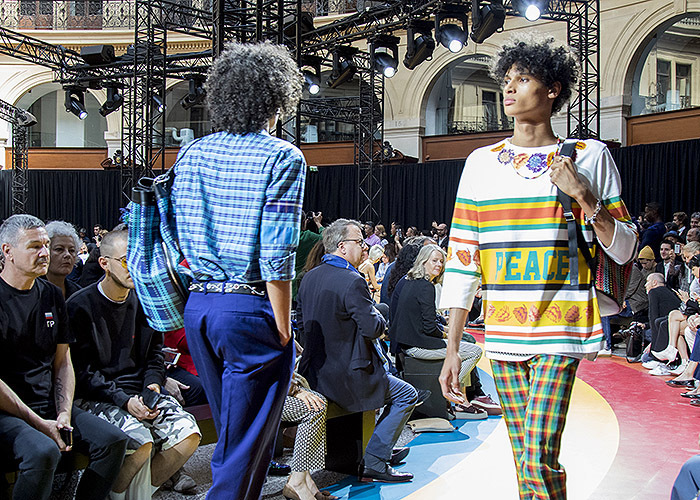 The models in the show were part of Paul Smith’s underlying social commentary about inclusivity and diversity, something he wanted to celebrate. 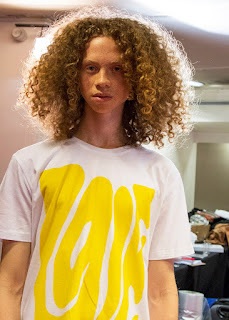 There were mixed-race models of all nationalites, some had masses of curls and Afros that made them look like tall, contemporary angels with halos of hair catching the light. 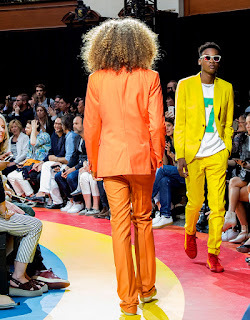 Walking towards each other, from opposite ends of the round catwalk, the models smiled and greeted each other as they passed in a choreographed display of cheerful recognition. 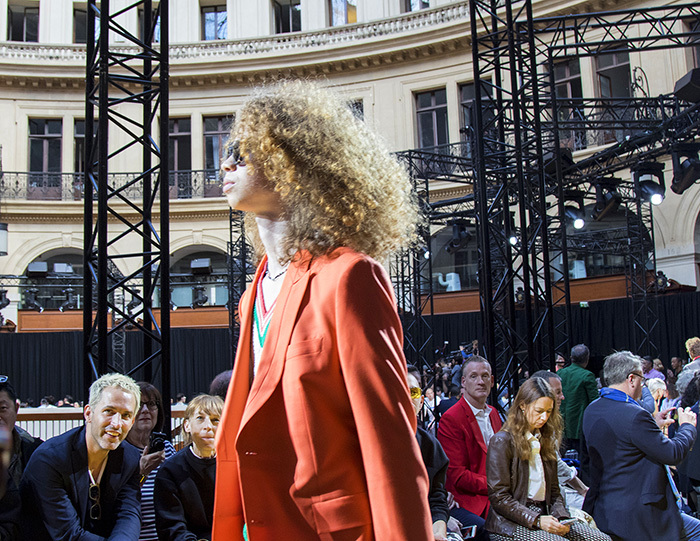 Overall, the collection had sixties tailoring written all over it with a modern edge. 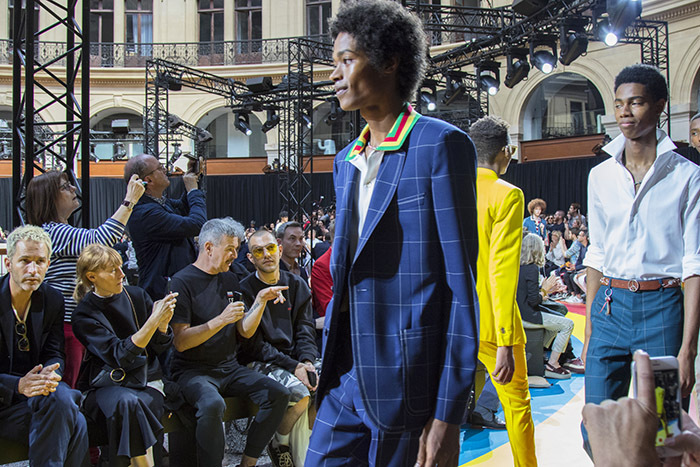 Surprisingly, the suits and jackets did not feel retro at all but utterly contemporary which is one of Paul Smith's traits. Vivid suits in royal blue and vibrant yellow mixed with matching hues of gingham shirts. 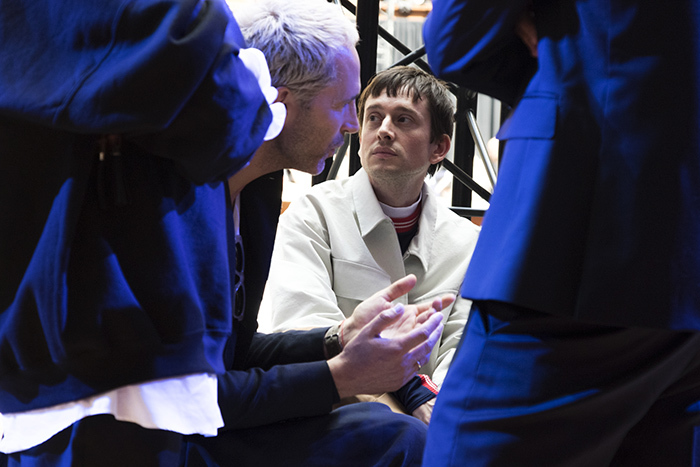 There were checked bomber style jackets and slim-line trousers. 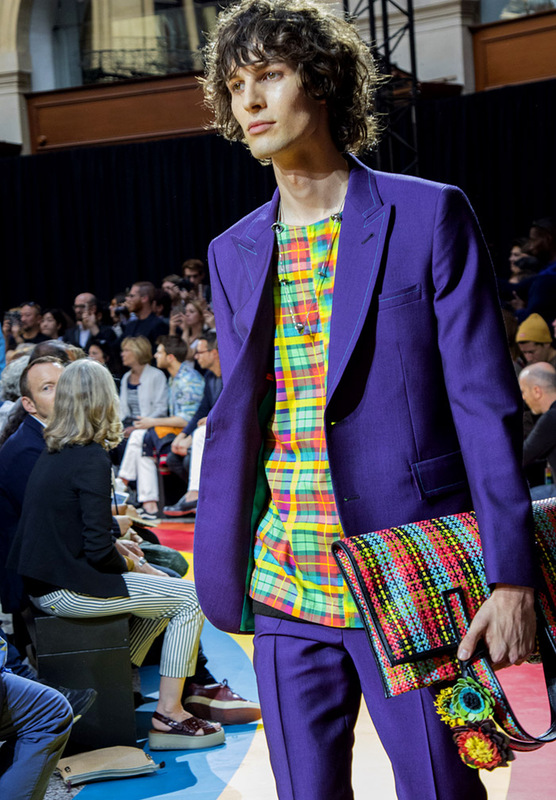 The bright suits were combined with blue gingham shirts, purple suits with green, yellow and red check shirts and matching oversized clutch bags. 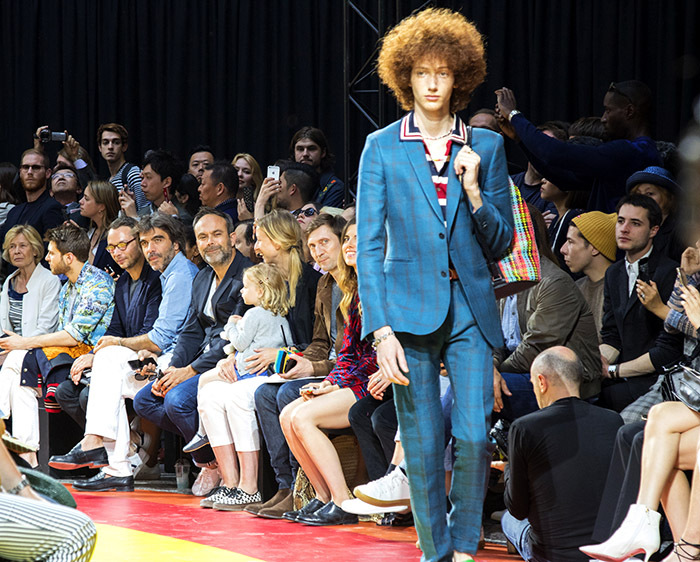 A model resembling a young Bob Dylan wore a shiny grey pair of overalls, while another model with a bright blonde Afro exuded an early Jimmy Hendrix vibe in a gingham suit jacket of acqua, yellow and red. There were also pieces in orange and green, almost all of the colours of the rainbow. The collection could have been garish but it was done with the designer's sophistication and signature style. 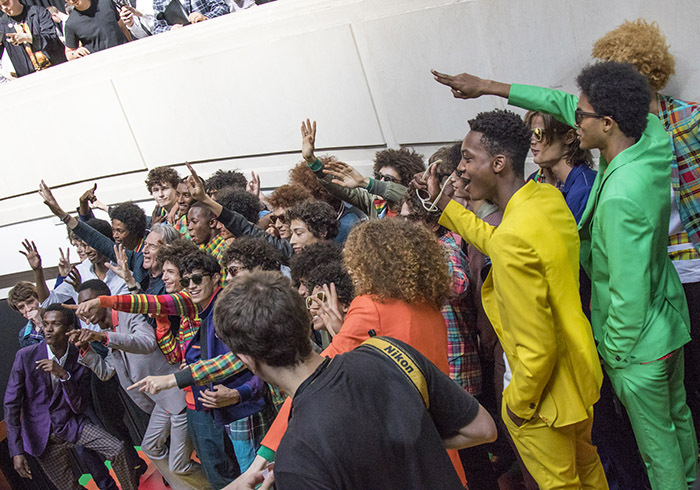 As Paul Smith walked around with his models for the finale on the runway, there was definitely an ecstatic feeling permeating the enormous space. 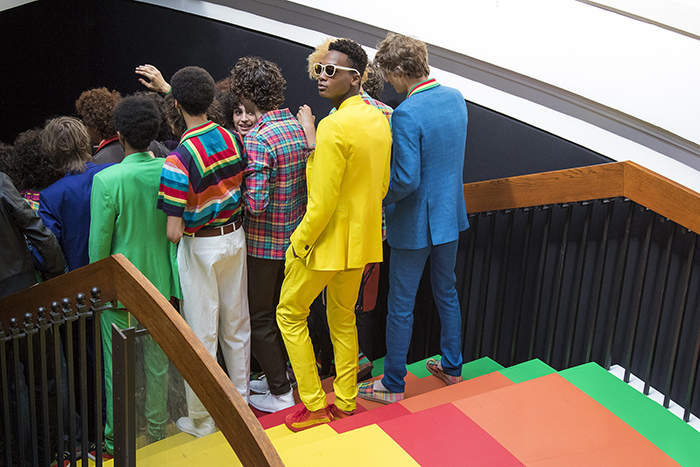 As the models descended the stairs along with the designer, they all stopped for a photoshoot for the surrounding guests and media that were crowded around and looking down from above. It had the feeling of a beloved and iconic musician being swarmed and adored by his fans. Yes, it truly was One Love. 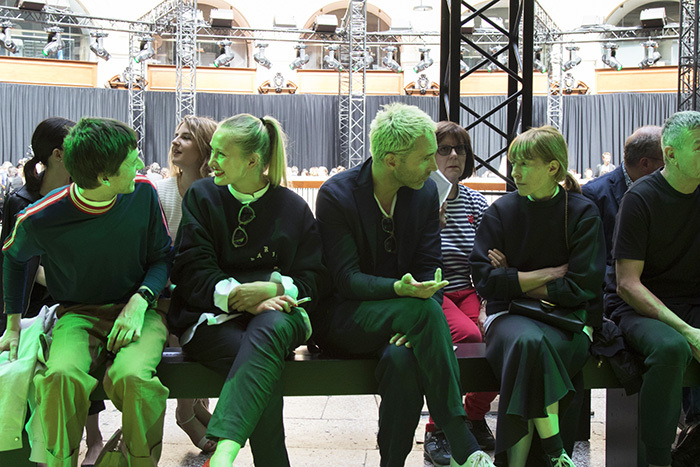 Guests chatting in the front row before the show starts.The pre-show vibe was very much an upmarket Notting Hill style festival and looked like one big cheerful party. 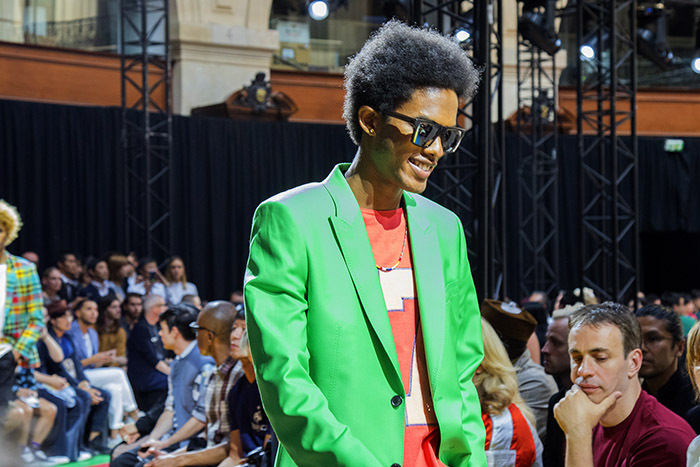 A modern mix of Bob Marley’s One Love signaled the models’ entry on to the runway circuit.